console.log("Of " + results.total + " tests, " + results.bad + " failed, "
Then, there’s another script block with the actual tests. The test method is called once, passing a string as the first argument (naming the test) and passing a function as the second argument (which will run the actual code for this test). This code then defines the now variable, which gets reused below, then calls the equal method a few times with varying arguments. The equal method is one of several assertions that QUnit provides. The first argument is the result of a call to prettyDate, with the now variable as the first argument and a date string as the second. The second argument to equal is the expected result. If the two arguments to equal are the same value, then the assertion will pass; otherwise, it will fail. 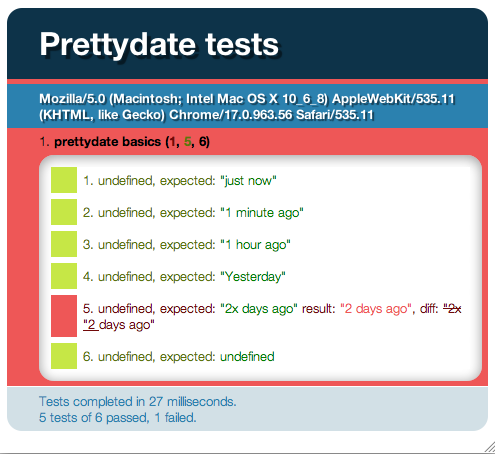 The new prettyDate.update function is an extract of the initial example, but with the now argument to pass through to prettyDate.format. The QUnit-based test for that function starts by selecting all a elements within the #qunit-fixture element. In the updated markup in the body element, the <div id=“qunit-fixture”>…</div> is new. It contains an extract of the markup from our initial example, enough to write useful tests against. By putting it in the #qunit-fixture element, we don’t have to worry about DOM changes from one test affecting other tests, because QUnit will automatically reset the markup after each test.